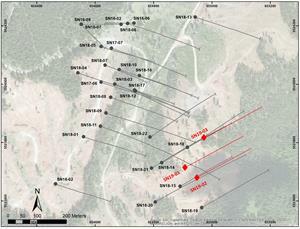 VANCOUVER, British Columbia, March 18, 2019 (GLOBE NEWSWIRE) -- Westhaven Ventures Inc. (TSX-V:WHN) is pleased to report drill results from its ongoing drill campaign at its 15,542 hectare Shovelnose gold property, located within the prospective Spences Bridge Gold Belt (SBGB), which borders the Coquihalla Highway 30 kilometres south of Merritt, British Columbia. Gareth Thomas, President & CEO of Westhaven stated, “SN19-01 contains the highest gram-metres (497.66 g-m) intercept to date on Shovelnose. It was drilled at 50-metre strike spacing between hole SN18-14 (435.36 g-m) and hole SN 18-15 (413.49 g-m). 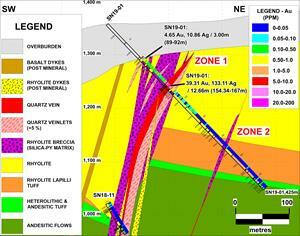 South Zone drilling continues to define the extent and demonstrate the continuity of this gold mineralized vein system. Drill intercepts of this grade and thickness strengthen management&apos;s belief that we&apos;re dealing with a large, high-grade gold system. The drill program is ongoing and all additional assays will be released regularly as the program progresses." Westhaven owns a 100%-interest in 4 properties covering over 35,000 hectares within the prospective SBGB, which is situated within a geological setting like those which host other significant epithermal gold-silver systems. It is close to major transportation routes and infrastructure allowing for cost-effective exploration. The SBGB is a 110-kilometre northwest-trending belt of intermediate to felsic volcanic rocks dominated by the Cretaceous Spences Bridge Group. Sable Resources and Westhaven have a combined control of 86% of the SBGB (225,000ha). Any ground staked by Sable within 5-kilometre of Westhaven&apos;s existing projects will be subject to a 2.5% NSR. In addition, Westhaven has a 30 day Right of First Refusal (ROFR) for a three-year period for any properties within this 5-kilometre radius. Westhaven Ventures Inc. is a Canadian based exploration company focused on the acquisition and exploration of prospective resource properties. Westhaven is focused on advancing its Shovelnose, Prospect Valley, Skoonka and Skoonka North gold projects in British Columbia. Westhaven trades on the TSX Venture Exchange under the ticker symbol WHN. For further information, please call 604-681-5521 or visit Westhaven’s website at www.westhavenventures.com.